Urgently Needed: Injured WildBabies need our support! Operating Table and Digital Scale! 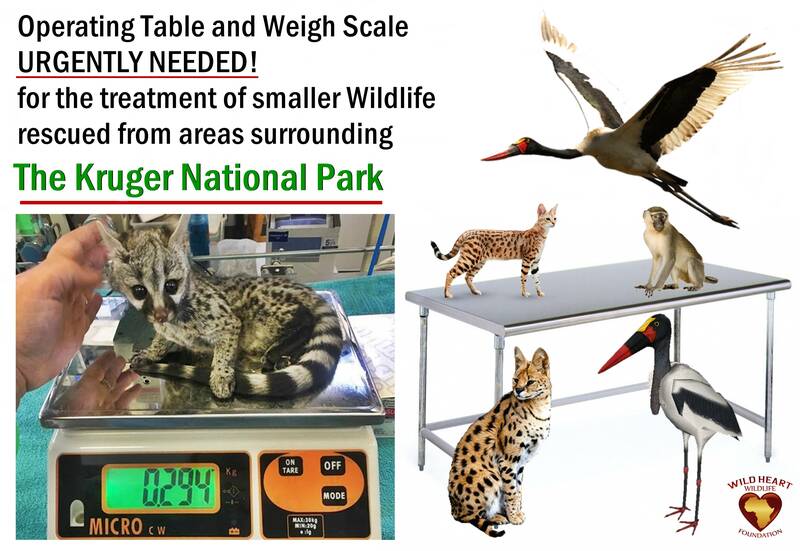 #WHWF urgently needs your help to purchase these items for a Wildlife Rehabilitation Center treating the smaller stricken wildlife from areas surrounding the Kruger National Park. The table is for treatment and operating purposes and needs to be Stainless Steel (USD 350), and the Scale (USD 160) is to accurately weigh patients as well as their medication. As always, we will show you exactly where your loving donations are being used. You can make a real difference to the lives of these animals by making a small donation. Thank you. 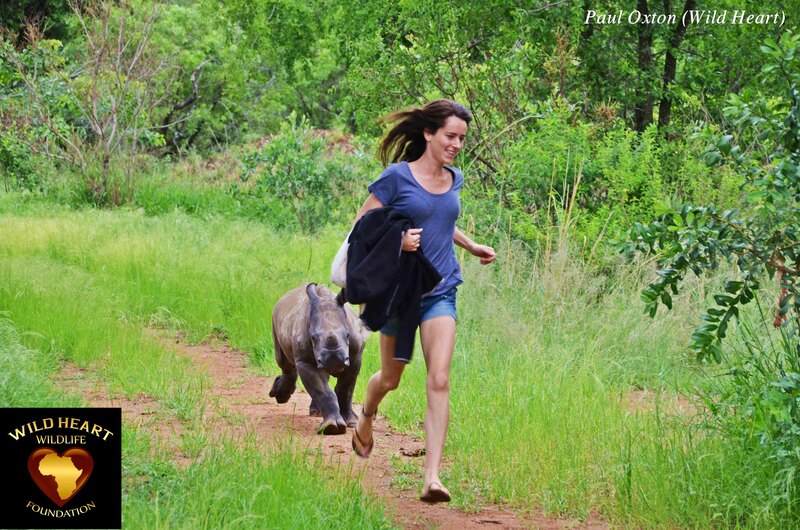 Rescued Rhino Poaching Orphan Nandi on the road to Healing! When Nandi first arrived at The Rhino Orphanage, she was everything a rhino shouldn’t be: alone, scared, sick, traumatized. Her mother had been poached a few days before, and Nandi had been eating sand because of hunger. This could’ve been fatal to the tiny two-month old cutie, who still needs milk every couple of hours. When this happens, the rescues are treated by adding psyllium husks to their food to try and flush out the sand from their intestines. In Nandi’s case this process has worked very well, and the amount of sand left in her intestines is decreasing daily. Rescued rhinos’ delicate eyes are treated by adding a lubricant to keep them moist a few times a day. If any bullet or slash wounds are present, they get treated during feeding times while distracted. Luckily, in Nandi’s case, it seems as if the adorable baby is out of the woods; she is drinking well, starting to eat solids, and her health is improving day by day. Wild Heart Wildlife Foundation sponsors various items critical to the care of these babies, including oxygen tanks, IV drips, food, medicine, cleaning equipment, mattresses and a host of other things going into the care of these orphans. Protection of the orphans is done through an anti-poaching unit supported by Wild Heart Wildlife Foundation. Supplying items that are needed, we make sure that the animals come first, and are provided directly with what is most needed at any given time. You can help: donate by clicking here..
Nandi arrived at the orphanage on 3rd December, she was about two months old, having just lost her mother to poaching. In most cases like these it is critical to get the babies to safety as soon as possible; sometimes they are flown in a helicopter to save time. Their eyes and ears will be covered to minimize external stimuli, because they are very scared. For the first few days, they will have around the clock care; their carers even sleeping with them on mattresses to monitor their vital signs. Baby rhinos love to wallow in mud - it protects their delicate skin from sunburn and insects. When they are tiny like Nandi, the carers lend a hand in getting them all mudded up, as they didn’t get to learn this behaviour from their mothers. There are a number of rhino babies of differing ages being looked after at the orphanage, and they all have different needs, according to their ages, just like human children. As soon as the babies begin to do a little better, they are taken on their morning walk, and as you can see in the video, Nandi has started to play a little. This means she is on her way to recovery, having been rescued only two weeks ago..
Nandi pictured below returning from her daily walk with her loving caregiver Jamie Traynor. 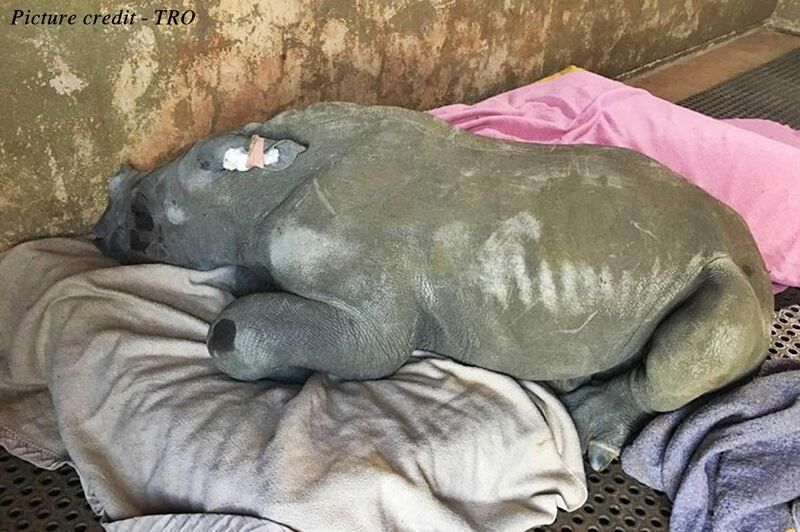 It is still a very long road ahead before this tiny rhino can be completely rehabilitated and returned to the wild, but luckily for her, Wild Heart Wildlife Foundation and The Rhino Orphanage will do everything in their power to make sure she grows up to be strong, healthy, wild, free and most importantly, safe. To help us care for these brave little survivors, please consider donating at the top of the page and also see what we do on the 'How can you help tab. Click here to visit us on Face Book. 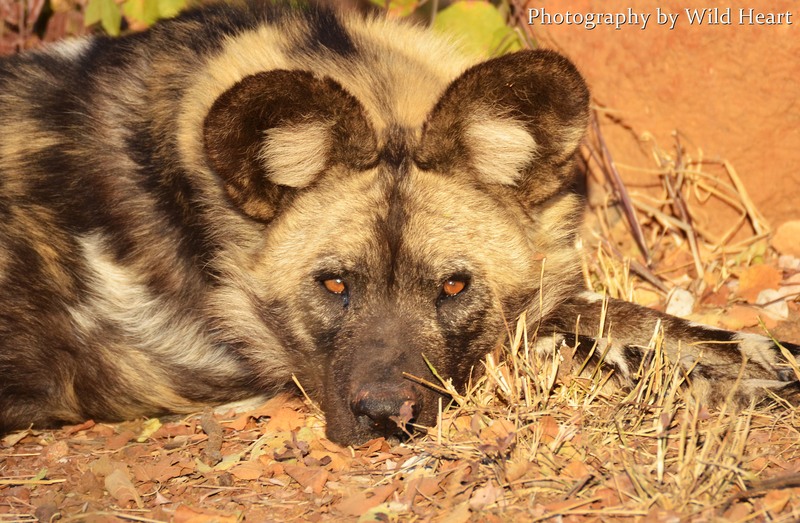 The African Wild Dog, Lycaon pictus (means ‘wolf-like, painted’), is without a doubt one of the most fascinating animals that roam the African wilderness. They are highly endangered, with only around 450 truly free-roaming (wild) animals in South Africa today. Sadly, they have disappeared from most of their natural habitat range. 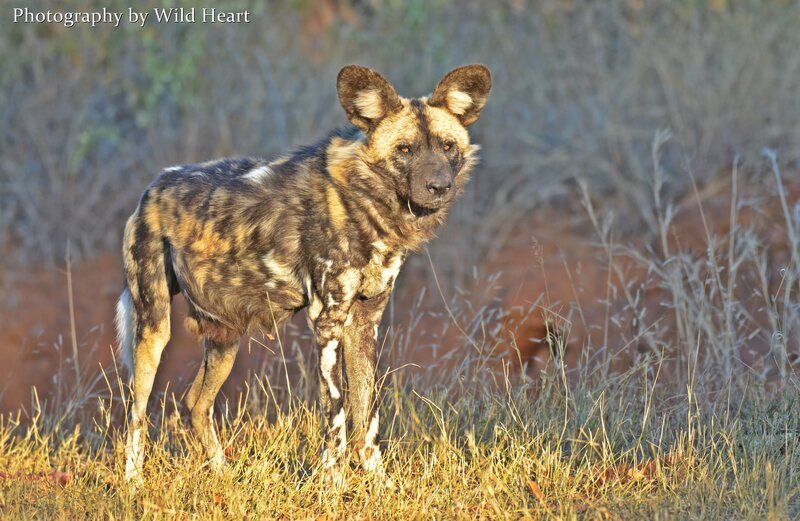 One of the four free-ranging populations in SA occurs in Limpopo, and this is the area where Wild Heart Wildlife Foundation is supporting a new research project to help save them from extinction. These amazing animals are dying out as a result of habitat loss, human persecution and the outbreak of disease. They are mercilessly killed by subsistence and livestock farmers as a result of human – wildlife conflict. 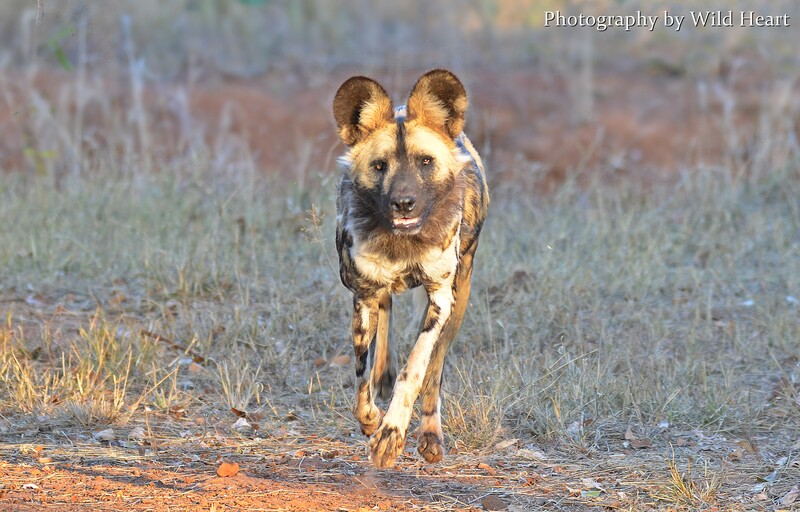 Wild Dogs are highly social animals, with strong family bonds and a firmly established hierarchy. There are typically an Alpha Male and Alpha Female who rule the pack, separately ‘ruling’ over members of their gender. All other members of the pack are subservient to them. The African wild dog is the bulkiest and most solidly built of African canids, standing 60–75 cm (24–30 in) in shoulder height, and weighs 20–25 kg (44–55 lb) in East Africa and up to 30 kg (66 lb) in Southern Africa. Hunting typically starts at dawn or dusk, and is preceded by an elaborate greeting ritual involving lots of woops, licking and tail-wagging. They are highly specialised diurnal hunter of antelopes, which get caught by chasing them to exhaustion. Highly effective, they hunt by approaching prey silently, then chasing it in a pursuit of up to 66 kilometres per hour (41 mph) for 10 to 60 minutes. 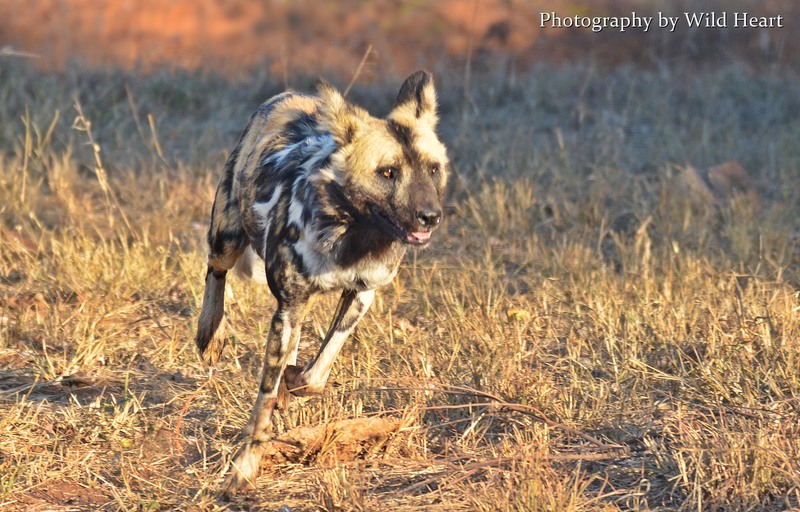 The same reason that makes these dogs such amazing predators, is one of the contributing factors to their disappearance – they are just such effective hunters, and need to eat much more per capita than e.g. lions. This makes livestock a prime target for them. The African wild dog is a fast eater, with a pack being able to consume a Thompson's gazelle in 15 minutes. 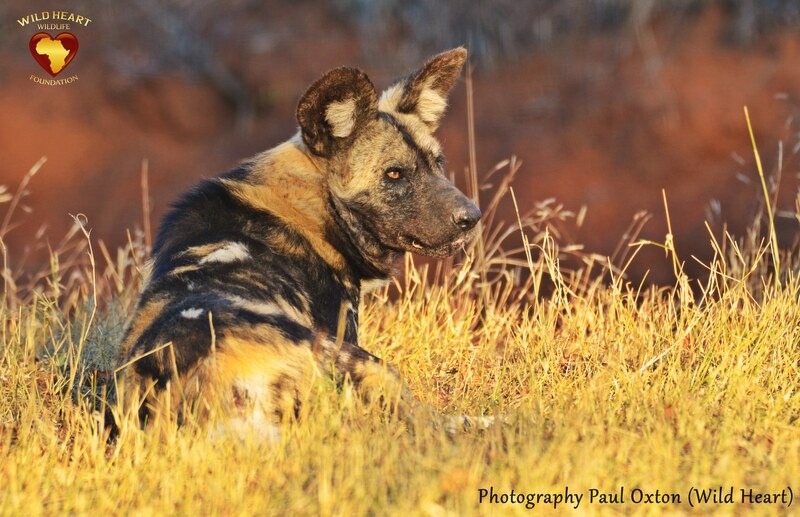 In the wild, the species' consumption rate is of 1.2–5.9 kg meat per wild dog a day, with one pack of 17–43 specimens in East Africa having been recorded to kill three animals per day on average. The young are allowed to feed first on the carcasses. Certain packs in the Serengeti specialized in hunting zebras in preference to other prey. One pack was recorded to occasionally prey on bat-eared foxes rolling on the carcasses before eating them. Hyenas sometimes act as kleptoparasites by stealing food that the Wild Dogs hunted. Wild Dogs appoint ‘nannies’ to look after their young when they go hunting. They would then bring the carers and babies food by regurgitating some of the meat so their family can eat. The gestation period lasts 69–73 days, with the interval between each pregnancy being 12–14 months on average. The African wild dog produces more pups than any other canid, with litters containing around 6–16 pups, with an average of 10, thus indicating that a single female can produce enough young to form a new pack every year. Because the amount of food necessary to feed more than two litters would be impossible to acquire by the average pack, breeding is strictly limited to the dominant female, which may kill the pups of subordinates. The San of Botswana see the African wild dog as the ultimate hunter, and traditionally believe that shamans and medicine men can transform themselves into the wild dog. Some San hunters will smear African wild dog bodily fluids on their feet before a hunt, believing that doing so will gift them with the animal's boldness and agility. There is only one of the factors contributing to their demise that we are in a position to address. 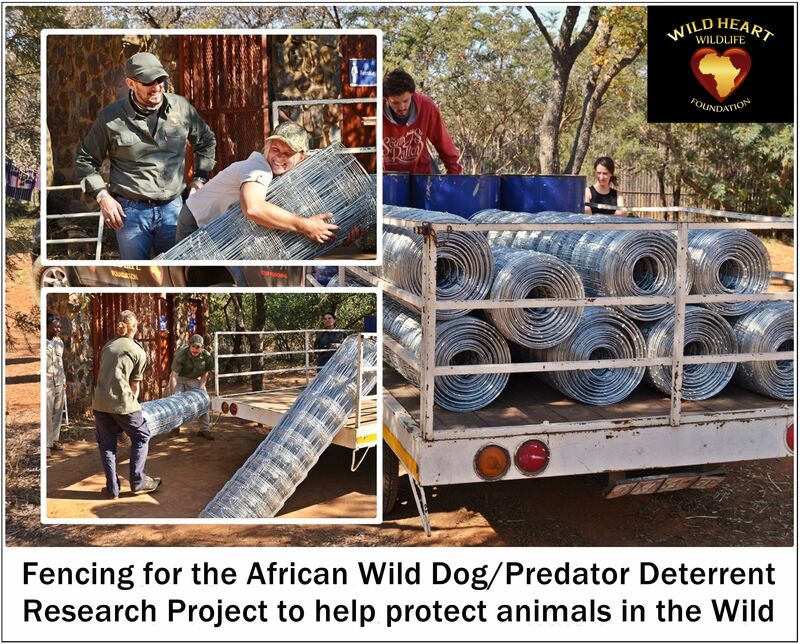 With the Wild Heart Wild Dog Project we are attempting to develop a practical deterrent to prevent Wild Dogs from attacking livestock. As it is still in the fledgling stage, we can only say that it would involve ultrasonic sound frequencies. If successful, this could be the solution to protect other endangered predators from human wildlife conflict as well. This project is crucially important to the continued existence of these precious predators in the wild. We are working closely with the Legend Wildlife & Education Centre, who also hosts the crucially important ‘The Rhino Orphanage’. 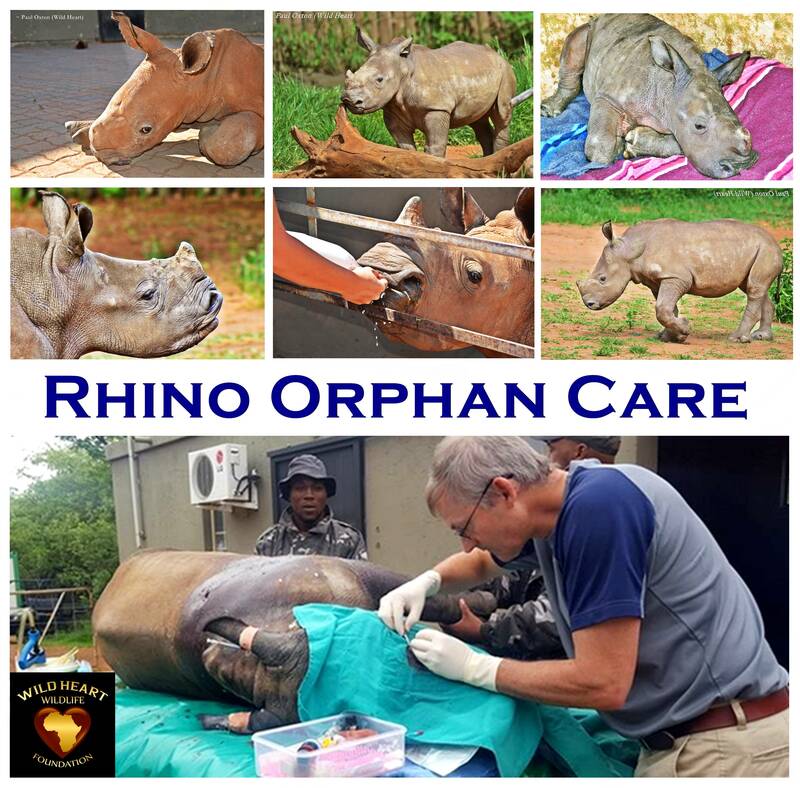 (Ongoing support to TRO’s Rhino Orphans is one of our main functions, and you can support us by clicking on this link; (Wild Dog Project/Rhino Orphanage). The complete development of a new camp for the newly-formed pack, including earthworks, fencing posts & hardware, electric fencing for the establishment of maintenance camps. We will need to build them an underground den, with monitoring equipment. In order to reduce the human imprint and let them not associate humans with food, a pulley system will be designed and built to drag and release food at random intervals, so that they can live as wild and free as possible. Once the camp and perimeter have been established, the real work will begin. The project requires start-up capital as well as ongoing funding, and we will post a dedicated wish-list as soon as possible. No amount is too small, and as always, we will show you exactly how your donations are being utilized as per our commitment to #EthicalConservation. 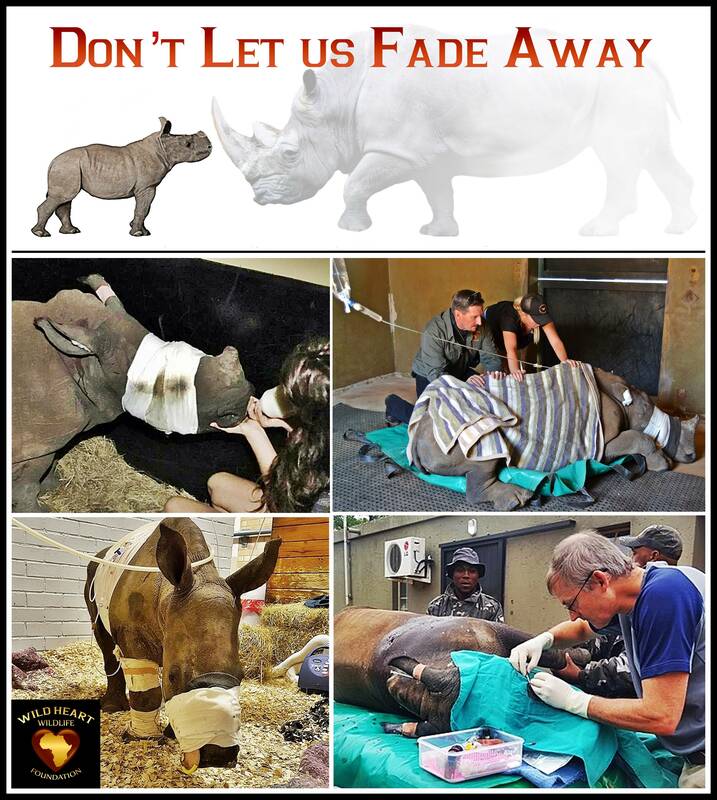 Help us to make a difference to the future of these amazing animals today. 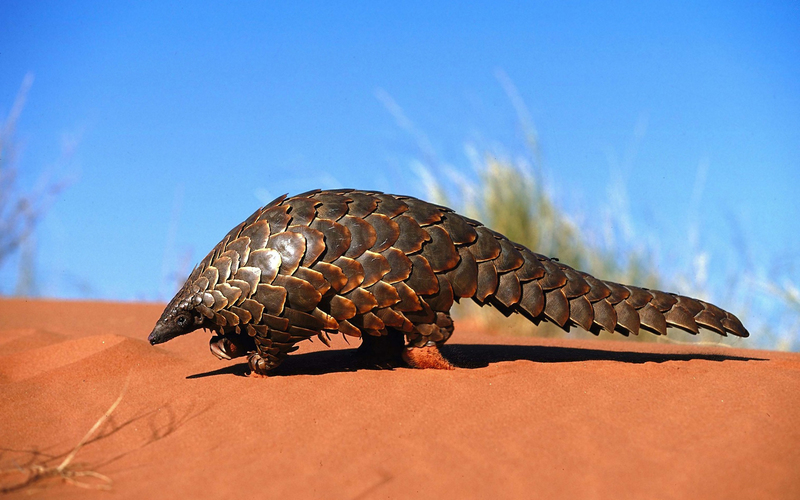 Pangolins are officially the most-trafficked animal in the world. In October of 2016 at the CITES convention held in Johannesburg, South Africa, all eight species were upgraded to Appendix 1. This means that international trade in animals is strictly prohibited. In addition to this there are some amazing people working tirelessly to save this exceptional species. All eight species are listed as endangered or vulnerable on the IUCN red list. There are eight species of this scaled and elusive creature. 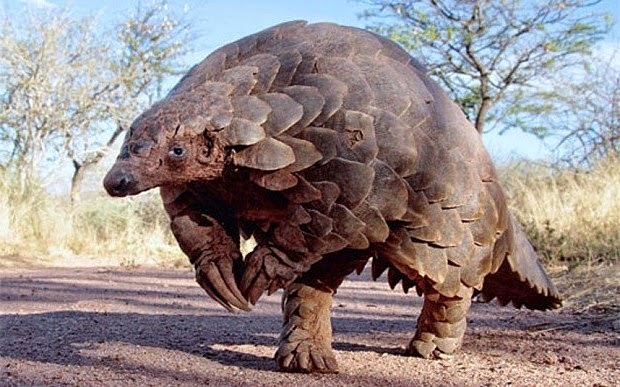 Four of them, The Indian pangolin, Formosan pangolin, Sunda pangolin and Palawan pangolin are found in Asia and are different because they have tiny bristles between their scales. 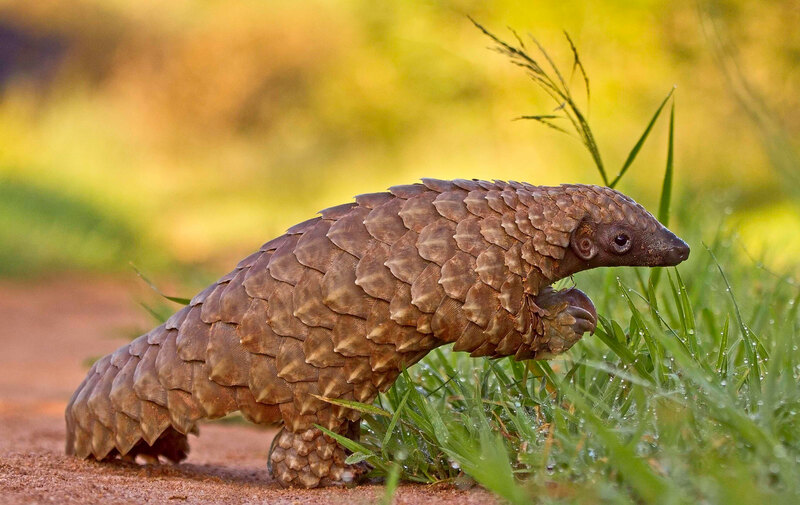 In Africa the four species found south of the Sahara are the Temminck’s ground pangolin, Tree pangolin, Giant pangolin and the Long-tailed pangolin. These ant- & termite eating little animals are the only mammals covered in scales consisting of keratin (the same as in fingernails, hair, and similar to rhino horn). As they have no defence against humans, aside from rolling themselves into a ball, poachers can simply pick them up and bag them without any resistance. This makes them vulnerable beyond belief. They only have one baby per year, in Winter. When threatened, they roll into a ball to try and protect themselves. The name ‘Pangolin’ is derived from meaning ‘something that rolls into a ball’. Humans are their worst enemy, as other animals mostly leave them alone. Lions and leopards will try their luck, but cannot bite through the scales. Pangolins walk on their hind feet, using their tails for balance and holding their front feet with its sharp claws in the air like hands. They use their powerful claws to break open termite mounds and ants nests to get to the juicy insects inside. They can climb trees and swim. Their lifespan is unknown, as they do not do well in captivity. The oldest recorded pangolin in captivity lived for 19 years. Pangolin scales are smuggled by the ton, meaning that thousands of these animals are being killed per month. It is estimated that around 100 000 pangolins are killed and smuggled every year. They do not have teeth, thus they cannot chew. The millions of insects they eat annually are ground up in their stomachs via stones and keratin to enable digestion. They grow 50cm – 1m in length, with their weight being 5 – 15 kg. Their sticky tongues can be longer than their bodies! Pangolins are Solitary, Nocturnal Animals. Poaching of Pangolins is fuelled by Superstitious beliefs of ‘Medicinal’ efficacy. A coat of armor made from Pangolin scales was given to King George III in 1820. Share this information on all Social Media Platforms. Educate Children where possible, and foster the love for animals in their hearts.